Bramble was about 2 weeks old when he was brought here twelve weeks ago. The story was that he had been found abandoned in a field. Mother may have been killed on the road or the sett deliberately destroyed. I asked that the area be searched as it was likely that there could be other cubs. He was so tiny that he had to be fed on a bottle normally used for orphaned kittens. He was fed 2-3 hourly, including during the night. 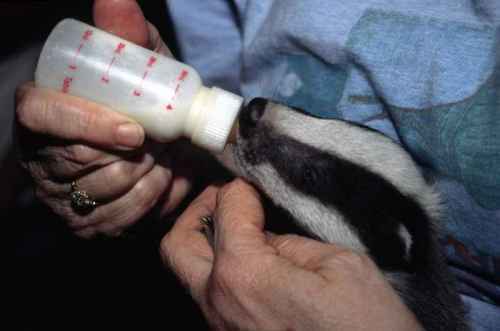 Badgers are allergic to cow’s milk so a replacement (Lactol) was used. He was weighted daily. Cub’s skin become very dry and may break so he was covered in baby oil every day. Feeds were reduced when he was big enough to take the regular baby bottle. Bramble (reluctantly) started taking solid food when he was 8 weeks old. Badgers like us are omnivores so they can eat almost anything. His usual meal in the evening consists of dry dog food soaked in warm water. Because he’s still very young, it may be too strong for him so rice crispies are added. He’ll take most fruits, vegetables, also cereals, pastas, eggs, bread etc. Favourite treats are chocolate (badgers are very sweet-toothed) sausages and tomatoes but his diet is varied day to day. Bramble now weighs 12.05 lbs but that may increase to about 3 stone weight when he’s a fully grown boar. In the wild his diet will consist mainly of earthworms. 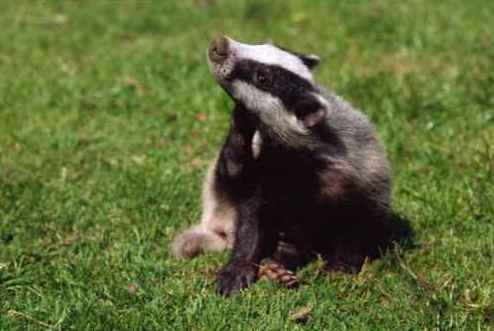 Badgers will eat about 200 earthworms in a night’s foraging. Severe problems exist at the moment because the very dry spell of weather and rock-hard soil makes worming impossible. They also eat beetles, slugs and all types of insects and small rodents. 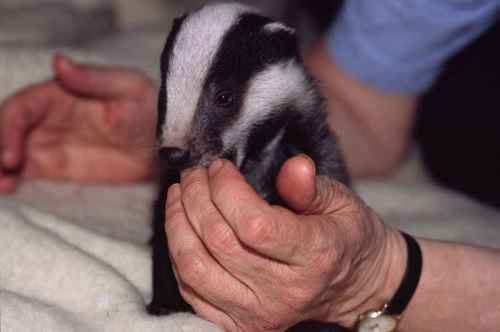 Badgers are nocturnal animals and are rarely seen in daylight. Bramble is, since June 1st in his new home in the country where other BadgerWatch members will continue to care for him. There, he’ll be prepared for returning to the wild. He’ll be walked regularly around and familiarised with the territory around his new home. Human contact will eventually be kept to a minimum and one person only will have responsibility for caring for him. He has settled in well. His pen is very roomy and secure so he has freedom to play about. To add to that he loves his large dog kennel in the enclosure. The latrine has already been dug and he become an expert in drawing in straw for his bedding. Like the rest of our badger nation, Bramble (Brammie) follows the code of being a first class house keeper! When autumn arrives he’ll be free to come and go as he pleases. The decision to stay or go will be his alone. Brammie remains a boisterous and affectionate fun-loving youngster. Caring for an offspring of one of our most vilified mammals has truly been a privilege.